Labour comfortably held Feltham and Heston early yesterday with an 8.5 per cent swing from the Tories, increasing its majority by more than 1,500 votes. • Labour comfortably held Feltham and Heston early yesterday with an 8.5 per cent swing from the Tories, increasing its majority by more than 1,500 votes. 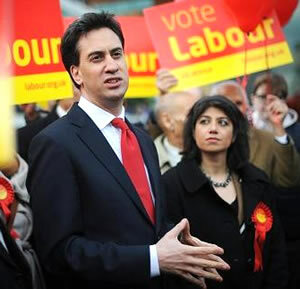 It was Labour’s fourth English by-election win in a row this parliament, Seema Malhotra following Iain McKenzie (Inverclyde), Jonathan Ashworth (Leicester South), Dan Jarvis (Barnsley Central), and Debbie Abrahams (Oldham East and Saddleworth) into the Commons. Ed Miliband, for whom the convincing victory will come as a relief following a torrid week, said the result was a verdict on the government’s “failing economic plan”, though he recognised it would be “a long journey” back to power. “I think it is pretty offensive that the Conservatives are saying this morning: ‘Well, what do you expect? It’s a traditional Labour area.’ They shouldn’t be denying the people’s choice. They should be listening to the people’s verdict. On a turnout of just 28.8%, Labour won with 12,639 votes (54.42%, +10.79% on 2010), the Tories came second on 6,436 (27.71%, -6.32%), the Lib Dems third on 1,364 (5.87%, -7.87%), with UKIP fourth on 1,276 (5.49%, +3.45%). A good night for Labour then, even if widely expected; in these no-win contests when your team’s under fire you’ve still got to slay the would-be giant killer, avert an upset and score more votes than your opponent. Wider afield, however, Labour’s ratings have dipped of late (Miliband’s in particular), with discontent rising in the wake of Wednesday’s poor PMQs performance – the last of the year. “With the House rising next week for Christmas, and following his underwhelming performance at Prime Minister’s Questions yesterday, Ed Miliband has much to think about as he heads home for recess. “In the midst of the economic crisis, and with the coalition tearing itself apart over Europe, Labour’s poll lead has vanished, with Miliband’s personal poll ratings, amongst all voters and Labour ones, whether it be a snapshot, over the medium term, or the long term picture since his election last year, particularly concerning. “The latest headline figures from YouGov’s daily tracker poll for The Sun give the Conservatives a two-point lead, 40%-38%; bad enough, but when delved into the full data (pdf) looks even grimmer for the Labour leader. 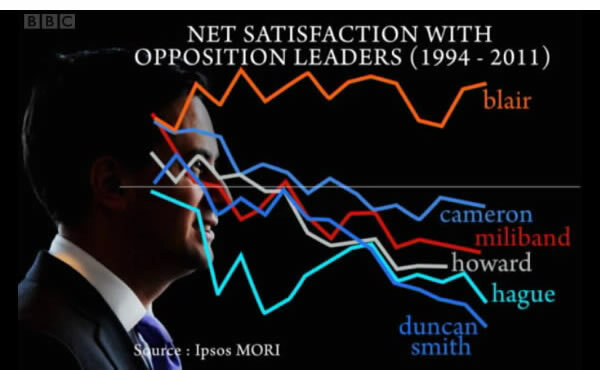 “Onto the longer term trends, and, as Graph 1 shows, though his satisfaction rating may be down only slightly, the percentage of voters dissatisfied with him has shot up – those who were initially don’t knows, now they do know, are overwhelmingly dissatisfied with the Labour leader’s performance. How, then, can Ed turn it around? Martin Kettle, writing in the Guardian, says the test is to win voters round in these times of ‘no more money’, to “present a credible alternative for voters”. “The next election will not be about what to do in good times but about how best to get through bad ones. That is why so much now depends on Ed Miliband. Only he can tell the Labour party, in the absence of an international boost of demand which shows absolutely no sign of coming, that a Labour Britain would have to cut its coat according to its cloth. “Only he has the authority to tell his party that Labour’s general election offer to the voters will involve no net extra current expenditure, and maybe even less. Only he can tell his shadow ministers to focus on radical manifesto ideas that involve no more money. • So, to those two main areas in which the coalition has experienced difficulties, difficulties Ed Miliband has been unable to capitalise on. First, the economy. As with every week it seems, there was yet more depressing news on the economy; on growth, unemployment, and the long-term picture it was grim, grim, grim this week for Britain. “The UK economy is likely to be in recession going into 2012 as the negative impact of fiscal tightening and falling real incomes is compounded by a downturn in demand from the UK’s largest trading partner, the euro area. On Tuesday, there was slightly better news on inflation, CPI down from 5.0% to 4.8%. RPI down from 5.4% to 5.2%. “Lower inflation will ease the squeeze on households’ real incomes (assuming wage increases are maintained at roughly the current rate). This might be expected to lead to stronger growth in consumer spending and in economic growth (though what happens in the eurozone will probably turn out to be even more important in this respect). To Wednesday, then, and the terrible unemployment figures – 128,000 more people will be jobless at Christmas, with the number of people out of work hitting a 17-year high – an unemployment rate of 8.3% – and, once again under this coalition, it’s women and young people who are hit hardest. “As well being a huge waste of talent the long-term implications of having one million young people out of work and study could be devastating for our economy. The cost of 16-18 year-olds not in education, employment or training runs in to billions every year. “According to the figures (pdf), Middlesbrough has an unemployment rate of 18.8 per cent. Blackley and Broughton, 19.9 per cent. One in five people out of a job: and those are the ones who still have the inclination to look. The list goes on: Bradford East: 18 per cent, Grimsby 13.5 per cent and Redcar 16 per cent. For these people, rebalancing is as remote a prospect as the government’s assurance that we are ‘all in this together’. “For those unemployed, it just isn’t good enough to be told there are 300,000 vacancies in the economy, the majority of which lie 200 miles away. IPPR North has urged the government to introduce a ‘northern job guarantee’. “To sum up, there has been another set of record bad figures, which would have looked even worse if it had not been for an increase in self-employment which isn’t necessarily a good thing. • To the second area in which the coalition has looked vulnerable, then, and the continued fallout over the prime minister’s European Union summit walkout last Friday. “Yesterday’s Populus poll for The Times (£) found support at 57%-14% while a Survation poll in the Mail on Sunday found support at 62%-19%. “But more in depth questions by YouGov (pdf) show that the public do not think that the outcome will be a happy one for Britain. As Chart 1 and Chart 2 show, just 24 per cent think the outcome will be good for Britain (31 per cent say ‘bad’), while a meagre 15 per cent think the summit will be ‘good for the British economy over the next few years’, with 34 per cent thinking it will be bad. Questions are also being asked about what exactly Cameron gained for Britain from wielding his veto, with it now looking increasingly likely the EU-26 will be able to use the “full panoply” of Brussels institutions, undermining one of the PM and chancellor’s key claims. “Cameron’s defence of his “veto” was the threat of the EU’s planned attack on the City, through the financial transaction tax, and the regulation of the banks. However, these excuses don’t add up. “Cameron’s second excuse of the threat of a financial transaction tax argument is even more flimsy. “Cameron has actually done his party no good. Although dramatically wielding the veto guaranteed 24 hours of positive coverage from Eurosceptics, the reality is Cameron didn’t win any of the safeguards for the City that he promised. “In fact, City institutions (including many Tory donors) will almost certainly pay a large price. The EU-26 will now press forward with proposals on corporate tax and a financial transactions tax with or without Britain. “Moreover, as Tory Eurosceptics realise they have less influence but are still bound by EU legislation, more and more will shift to more extreme parties like UKIP and the BNP. It is now almost inevitable separate structures will be set up for the 26 countries who either agreed the deal or are awaiting approval from their national parliament, with Britain on the outside. “That will be bad for Britain and for the EU, with a whole new panoply of bodies, some with their own separate presidents. “But Britain has suffered the worst of all worlds. On policies for the EU-27 our MEPs will have fewer allies and we will have less negotiating clout in the Council of Ministers. On economic policy, and anything the EU-26 want to talk about, we will be shut out completely. Cameron has achieved splendid isolation – with nothing in return. Also this week on Left Foot Forward, we’ve got the scathing reaction of Scotland, Wales and Northern Ireland to Cameron’s walkout; James Denselow on how Cameron has turned Britain from an outlier into an irrelevance; Tony Burke on how Cameron has sold out UK manufacturin; and today, Ben Mitchell on where next for the left in the Europe debate. Labour candidate for London Mayor Ken Livingstone, who this week pledged to establish a London-wide non-profit lettings agency and introduce a London Living Rent for the capital. He said that, if elected in May, he would bring in a “fairer approach” to housing than current Mayor Boris Johnson, whom he said had “completely failed” on housing. “Londoners need help with the housing crisis right now. As for Mr Johnson, well, on Friday he launched the ‘Boris Bus’, a new Routemaster to replace the bendy bus – at £1.3 million each, five times the cost of a green, hybrid double decker that will run on just one of London’s 700 routes. “When, from January, Londoners from Barnet to Bexley and Hillingdon to Haringey will be paying a massive 50 per cent extra for their bus tickets, they should remember where a large chunk of their fares are going. Tory MP Aidan Burley, who was filmed sipping champagne in a plush Alpine restaurant next to friends dressed in Nazi uniform, giving Nazi salutes, chanting “Hitler, Hitler, Hitler”, toasting the Third Reich and taunting a French waiter… This fine, upstanding Member of Parliament did not lift a finger to stop any of this, did not say a word, just sat there like a grinning half-wit revelling in his well-heeled chums’ sickening behaviour. The Resolution Foundation’s “The Missing Million” report (pdf), which examined “the potential for female employment to raise living standards in low to middle income Britain”. “When we do identify a possible source of future household income growth – and especially progressive household income growth – we can’t afford to pass it up. The good news on this front is that two reports this week point to one such opportunity: growth in women’s employment. The first report, our own from the Resolution Foundation, shows quite how much headroom we still have to raise female employment in Britain. 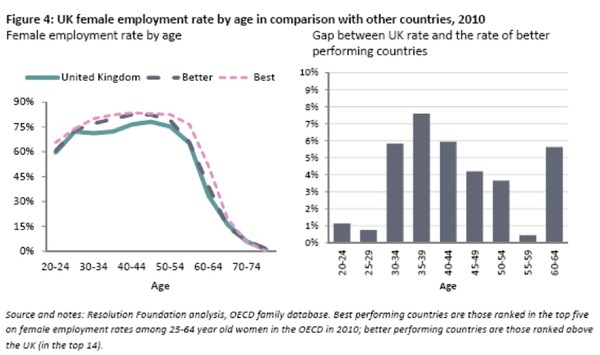 “In 2010, the UK ranked just 15th in the OECD on female employment, just behind Slovenia. If you compare the UK’s performance to better performing countries, around a million women are missing from the UK workplace. “For Labour, too, the UK’s performance on female employment raises some difficult questions. “Their years in power saw a dramatic expansion of publicly-funded childcare but also a much more significant increase in spend on tax credits, including billions spent on families with older children. Was that balance right or could more have been done to build institutions such as universal childcare, supporting more women into work? Newt Gingrich’s position as frontrunner for the Republican Presidential nomination has been cemented this week after polling revealed he currently holds a 9-point lead over Mitt Romney. Gallup polling suggests Gingrich’s rapid rise to prominence is in large part due to his popularity amongst core GOP voters. Roughly 40% of those aged 55 and over and 40% of those who identify themselves as conservative currently favour Gingrich, a stark comparison with Romney who hovers around 20% in each of these key groups. Romney’s support comes from those who consider themselves to be on the moderate end of the party and in particular younger voters, amongst whom he enjoys a 7-point lead over Gingrich. Romney’s past has come under more scrutiny this week, with Friday’s Telegraph reporting that questions have been raised over his life as a “poor Mormon missionary” in France, with people who knew him at the time revealing he “was not as poor or arduous as he has claimed”. Meanwhile the Tea Party continue to stir, as Alex Hern reported on Left Foot Forward this week, with The Guardian’s Jonathan Freedland noting how the broadcast wing of the Tea Party, Rupert Murdoch’s Fox News, are inadvertently helping Barack Obama’s re-election bid, by “putting off the best Republican candidates”, making Obama “much less vulnerable at the election”. To the President, then, and there was some good polling news for him this week; he has seen his disapproval rating slip below 50% and polling suggests that amongst undecided and independent voters he enjoys a strong chance of beating Gingrich with a recent WSJ/NBC poll suggesting Obama enjoys an 11-point lead in a head-to-head with Gingrich. Elsewhere, an end of an era has been marked in Iraq this week, with the last US troops finally withdrawing from the country after a 9-year occupation. A formal ceremony was held on Thursday to mark the end of their deployment, with the last troops due to return home at the end of the month. Vladimir Putin, meanwhile, continues to command headlines. In the time since the contested election results were announced he has accused protesters against his regime of being lackeys of the west and blamed the US for the killing of Colonel Gaddafi. However, things at home are not looking so promising, with a rally in support of his United Russia party failing to come close to filling the square it was supposed to dominate. While in France, former President Jacques Chirac has been given a 2-year suspended sentence after being found guilty of embezzling public funds. The charges relate to M. Chirac’s time as mayor of Paris, with the court ruling he had used public money to reward supporters and support his political party. Rumours about his misconduct have been floating around for years, but during his tenure as President he was immune from prosecution. Johann Lamont is the new leader of Scottish Labour, beating off competition from fellow MSP Ken Macintosh and Tom Harris MP. She succeeds Iain Gray, who quit after Labour were routed by the SNP in May’s Holyrood elections. In her victory speech this lunchtime, Ms Lamont pledged to “make Labour Scotland’s party once again”. Anas Sarwar MP is the new deputy leader of the Scottish Labour party. For more on Lamont, read her article on the scourge of pay-day lenders on Left Foot Forward last month. Earlier this week, first minister Alex Salmond argued that an independent Scotland joining the euro was “a long term possibility”, with polling by Ipsos MORI indicating a slight boost in support for independence – standing at 38% – with 33% calling for a referendum as soon as possible. Amongst those saying they are certain to vote, 68% backed the option known as ‘devo-max’, up one point from August, with 28% not backing it and 4% unsure. “Although our poll last week revealed growing support for the SNP, a clear majority of Scots do not currently support full independence and would prefer to remain part of the UK, albeit with the Scottish Parliament given substantial new powers. Audit Scotland, meanwhile, reported that despite health spending rising by £232 million in 2011/12, it presented an effective spending cut of 1.4% in real terms due to inflation. Also this week on Left Foot Forward, we reported on how the SNP’s anti-sectarianism bill had been roundly condemned by all the opposition parties at Holyrood, while SNP president Ian Hudghton MEP, the party’s leader in the European Parliament, wrote about how David Cameron’s EU summit walkout risked leaving Scotland’s fisheries to rot. Plaid Cymru AM, Leanne Wood, become the fourth person to announce her intention to stand for the leadership of her party. “My first-hand experience of recession and its impact during the 1980s gives me a determination to make sure that we do not lose yet another generation to youth unemployment. Tackling those economic challenges goes hand in hand with our journey to independence. Meanwhile, as much of the attention focused on Alex Salmond’s attack on David Cameron over his stance at last week’s EU Summit, Welsh first minister, Carwyn Jones, had stern words as well. “Since devolution began the Welsh government has consistently sought to work constructively with the UK government in pursuit of those interests which, though devolved, are shaped by decisions made at EU level. Speaking during a DUP-initiated debate on the government’s handling of last week’s EU summit, the former SDLP leader, Margaret Ritchie, accused the coalition of failing to show any respect for the devolved administrations. “Not only did [David Cameron] appear to fail to consult his coalition partners; more importantly from our perspective in Northern Ireland, he failed to consult any of the devolved administrations, despite the fact that his actions could have profound implications for those jurisdictions. “I ask the government seriously to consider those implications in the medium and long term, because there are many economic, financial and social benefits to membership of the European Union. Speaking ahead of a meeting of Westminster and Stormont ministers, meanwhile, finance minister Sammy Wilson argued that the price had to be right if powers over corporation tax are to be devolved to Northern Ireland. Also this week in Northern Ireland, debate raged over whether God Save The Queen should be scrapped as the anthem of the national football team – see my article for more. Labour hold Feltham but deeper problems remain – http://t.co/aek8bsrd – Good analysis from Shamik Das. Labour held Inverclyde and Barnsley? Wow. Can Miliband also confirm whether or not bears defecate in woods? You’re exactly right: all you can do in a safe seat is win, and that’s what Labour did (increasing its majority in the process). Good news for the party; a welcome change for beleaguered members, I would imagine. The guy has no clue and the personal polling now reflects this. Good political systems require strong opposition, not some no-hoper giving the PM an easy ride. The questions I have are whether Labour MPs ruthless enough to depose him (not likely, given their inability to ditch Brown) and whether there is even anyone capable waiting in the wings, should a Brutus figure step forth?